The Octalysis Group helps clients all over the world to increase their ROIs through gamification and behavioural design. We have developed a tried and tested Implementation Model to drive significant impact on business metrics. So far, our work has improved the experience of over 1 billion users globally. 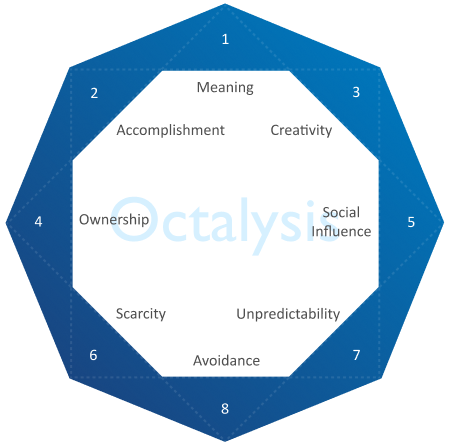 The Octalysis Implementation Model is based on the Octalysis Framework that identifies 8 Core Drives that motivate people to take action. When no Core Drive is present, no action happens. The strategy dashboard contains key business metrics, desired actions and target group specifications and other relevant information. The brainstorming phase includes potential features to cover all strategic phases of a user journey, thoughtfully tied to the 8 Core Drives within the Octalysis Framework. The feature list identifies and sorts relevant and central features to ensure long-term motivation and sustainable engagement. The Battleplan contains all relevant information for the project, including incentives, triggers, reward schedule and many more. The wireframes, as part of our full design package, lay out the complete user journey with special focus on maximazing user motivation throughout the entire design. In Explicit Gamification users acknowledge they are playing a game, and oftentimes need to opt into playing. Implicit gamification includes design techniques that do not show signs of a game, but it heavily ties the 8 Core Drives of Octalysis into the user experience. Which concept is more suitable for your organization? Contact us and find out. We work at the intersection between user experience design, behavioural design and business goals. That is how we generate significant improvements for products, organisations and society. UX / UI focuses on design and usability. In the modern world, this has become increasingly important. But it doesn’t end here. Behavioural design takes into account that users are people, not robots. Therefore, we optimize for maximum engagement and motivation throughout the whole customer journey. But all this needs to be linked to business goals. The important question is: How exactly do you combine UX/UI and behaioural design in a way that benefits your project? Imagine a world where everything is fun - even what you might call ‘work’ today. The result is our world leading Octalysis Engagement Strategy. We have helped 100+ companies world-wide achieve their goals. Become one of them.